Silver Falls State Park has 10 waterfalls tucked into a lush 9,000-acre rainforest in north central Oregon. Three of the more spectacular falls are accessible by car. South Falls, North Falls and Winter Falls all have their own designated parking lots. To get to the remaining seven, you have to hoof it down dirt trails, up hills, over creeks and past cliffs. Ten waterfalls in a seven-mile loop. The cool part: You get to walk behind some of them. My 13-year-old son and I stuffed granola bars and rain gear into our hydration packs and took off counterclockwise down the path, keeping a good pace to be mindful of our non-hiking companions who planned to mill around the main South Falls complex with its lodge snack bar and gift shop (cool purchase: trail map on a micro fiber lens cloth). I handed my son an orienteering compass and the paper map so he could practice his navigation skills. To shave off two miles and three falls, we took a shortcut at Winter Falls. So, seven waterfalls in about five miles. The first one we came to was Winter, which was unimpressive at the time, only a slight trickle. It was summer, so perhaps Winter Falls is more of a winter waterfalls. From there we darted north, crossed the north fork of Silver Creek and followed it downstream to Middle North Falls. Again, this wasn’t at full flow but had more water falling compared to Winter. We took the side path behind the falls, taking in a little of the spray and ending up under a cave-like overhang on the other side. Back on the main path, we passed Drake, Lower North and Double Falls, skirting some cliffs and a viewing deck. After crossing the north fork again and waiting out a short bottleneck of hikers (some in flipflops), we followed the creek for another mile before we made a miscalculation at the confluence with the south fork where the trail split. On paper, the Maple Ridge Trail is only one mile, compared to the 1.3 mile west branch of the Canyon Trail, with both trails ending at the trailhead. Again considering the non-hiking folk who were into hour two of milling around, we opted for the shorter Maple route. Which turned out to be uphill, and uphill, and uphill some more. Switchback after switchback. Figuring in the time to make the elevation gain and the rest breaks, the Maple trail probably took as long as the longer Canyon trail, but the Canyon trail probably had a better view. From there, the hike ended at the centerpiece South Falls, which also boasts a walking path underneath. More on Silver Falls from Oregon State Parks. With cold weather already here, we thought this 7-minute video would inspire a little winter exploration. Produced by Uncage the Soul Video, the piece was shot Mount Hood’s Sandy Glacier caves and documents the decay over the past decade. “It is one of the most challenging environments to film in. Not only does its remote location mean hauling hundreds of pounds of equipment high up on the slopes of Mt Hood, but once inside the cave, the wet, cold, dark, and dirty conditions create a myriad of complications. There was a staggering amount of structural collapse and rockfall that was observed and managing risk while filming was a top priority,” producers wrote in their notes on the video. Boats on the river in downtown Portland, OR. PORTLAND, OR — Even if you’re an adult, I recommend the children’s treasure hunt at the Japanese Garden, not so much for the coloring map or the prize at the end (it’s a bookmark), but because it forces one to take a closer look at the surroundings. 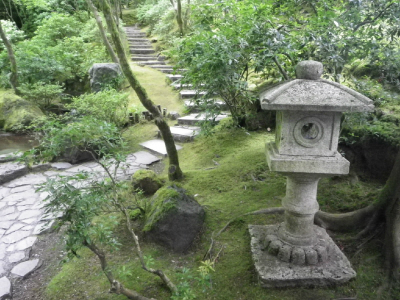 The garden, nestled into the hillside of Portland’s Washington Park, has five different styles sprinkled with statues, stone lanterns and fountains. There is so much beauty, it’s easy to miss the subtle details. A small statue of a jizo (Japanese protective spirit) guards the entrance to the zen garden. I walked right past the guy, carved into a foot-tall moss-covered stone, but the kids found it. It was on the scavenger hunt list. That was the morning. After a microwave lunch at the hotel, it was off to Mollala to go geocaching with the cousins. More photos at our gallery. The pedestrian bridge at Multnomah Falls. COLUMBIA GORGE, OR — This is one of those places I wish I could spend a whole week camping, hiking, exploring the sights. But we didn’t have that kind of time. We went early in the morning and took in the Columbia Gorge from the interstate at the bottom (the place is only about 20 minutes from Portland). There was light barge traffic and a few sailboats on the river. It was a breathtaking view. Around noon, we met up with our local guides at the Vista House on Crown Point. The building itself is an impressive piece of architecture (looking back, I’m disappointed I didn’t get any photos of it). The polished marble and brass structure has a deck with a great 360-degree view from the gorge’s top. There’s even a snack bar, museum and gift shop tucked away in the basement. From there, my brother and his family led us through the scenic cliff-side roads that wound past the minor falls before reaching the centerpiece of the gorge that is Multnomah Falls. A word to the wise, come early to get a good parking spot. There is also overflow parking from the interstate. We hiked up part of the way to the top with the kids and the cousins. We ended the day at a Portland playground, letting the kids run loose. For more photos, go to our gallery. View of Portland from the OHSU tram platform. PORTLAND, OR — After two full days of driving and sightseeing, we decided to have a low-impact day at our base city. It was low-impact until we started driving through city traffic, dodging semis, negotiating construction and keeping an eye out for the ever-present bicyclists who zip around the crowded streets. In the morning, we took the sky tram. It was a quick trip, but the view of the city below was worth it. The tram isn’t anything fancy. It links the Oregon Health and Science University on the hill to the lower city, and staff can ride free. The rest pay $4 for a round trip (actually, they only check your tickets going up, some you could probably ride down for free). The 4 year old was nervous at the start of the ride but then became intrigued by the scenery. The platform at the top also had a good vantage point of the city. Lunch was microwave fare in the hotel room. Again, low impact, and they actually ate it all. The afternoon was the Oregon Museum of Science and Industry. More photos at our gallery. Also, stay tuned for a tram video. NEWPORT, OR — Yaquina Head Outstanding Natural Area is on of those places I could easily spend a whole day at. It has history, hiking and wildlife packed into a rocky mile-long peninsula that juts into the Pacific. 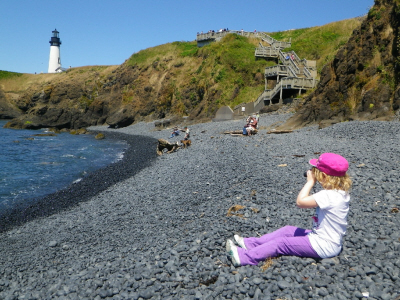 The park, run by the U.S. Department of the Interior, has a historic lighthouse at its tip and boasts a cove and a cobble beach inhabited by gulls and harbor seals. There are three easy hiking trails, and on most busy days the parking lot closest to the lighthouse fills up. This forces visitors to get out and enjoy the walk from another parking area at the museum. There’s a sound the cobbles make. The waves crash into the shore with a roar and a hiss. And then if you listen closely, you can hear the smooth rounded stones roll in the wake as the water recedes. The lighthouse has 104 steps to the top, and it was built in 1873 to replace the bay lighthouse to the south. The bay lighthouse was built in 1871 but decommissioned three years later because it wasn’t visible enough, according to one of the brochures. After the lighthouse, we spent the rest of the day at the Oregon Coast Aquarium (also in Newport). Then we headed back to Portland. More photos of the trip in our gallery. NEWPORT, OR — There is something to be said for traveling with local guides as opposed to the automated directions calculated by a mapping website. 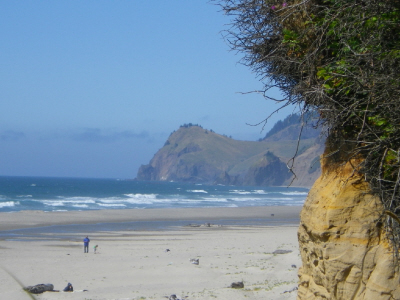 The bonus for us was taking a northern route to Newport via Lincoln City that passed through a beautiful swatch of Pacific coastline (the web suggested a route through Albany that was probably faster but had no coastal drive). It was two lanes for most of the journey, but those two lanes passed scenic cliffs, boats, marinas and crashing waves. The path also wound through some captivating wooded hills (I say captivating, my wife, who got motion sickness, said nauseating). On the way down, we stopped by the Chinook Winds casino for the buffet, and the kids caught their first glimpse of the Pacific Ocean on the beach behind the casino. From there it was south to Newport, where we stayed at the Whaler. The rest of the day was spent hunting in tidal pools and flying kites on Nye Beach. For dinner we closed down the Sizzler. — Before starting off of the coast, we got up early and attempted to visit the Japanese gardens at Washington Park in Portland. They didn’t open until noon, so was opted for the rose garden just downhill. Also found a neat playground nearby. PORTLAND, OR — What loudly tromps up and down the hotel hallway at 6:30 a.m. while most others are sleeping? Kids from the Midwest visiting Oregon whose internal clocks are hours ahead of the host population. Despite a full day of traveling and a near-midnight dinner the day before, the kiddos are up early and ready to explore. 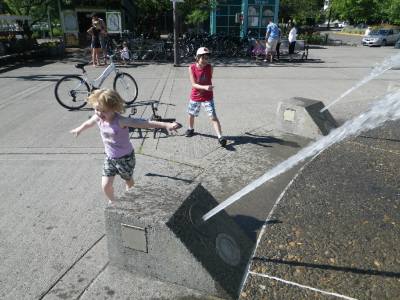 We load up at the free breakfast and hit Portland’s McCall Waterfront Park. We are part of the few walkers in the throngs of bicyclists and joggers scooting along. Some people appear to be camping. The 8 year old leads us across a bridge to the Willamette River’s east bank, and we stumble into The Big Float, a buoyancy fest set for later in the day. Everyone has kayaks, canoes, tubes or water wings and is amassing at the base of the bridge where a stage is set up. She bends over, mouth agape, and I pull her back before the torrent knocks her across the park. Later that morning we hook up with my brother and his family at Enchanted Forest just south of Salem. The attraction started with a man who carved tableaus of storybook characters and evolved into an amusement park with a rollercoaster, log ride and miniature themed villages commemorating the wild west, the middle ages and so on. More Oregon photos in our gallery. OVER THE GREAT PLAINS — Flight to Portland with a short layover in Minneapolis. On the way to see my brother and his family. This will be our 4 year old’s first flight and the second plane trip for our 8 year old. Also, it’s the first time to Oregon for my wife. I’ve been to Oregon once before. When I was a teen, we went there as a side trip after visiting the California branch of the family — cousins on my dad’s side. I remember Crater Lake, the cliff-lined rocky coast and old growth forests. I remember learning the state doesn’t have sales tax when I bought a Judges Guild game that had wandered a few thousand miles from its Midwest roots. 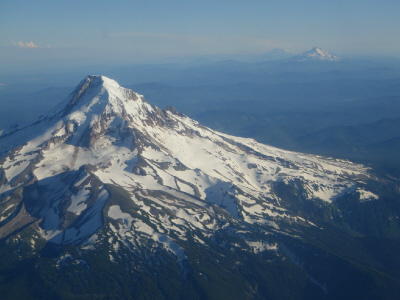 This time it will be the Mount Hood area and the Willamette Valley. I checked out (and twice renewed) a dated Frommer’s guide to the state, so we’ll see what’s in store. Waiting for the refreshment cart to snail its way to our Row 37 seats on the three-hour flight, I realize I should have packed more kids movies into the iPod. I’m siting with the 4 year old, and she’s hungry, and it’s the only thing keeping her calm. She’s already worked her way through a Snoopy and is deep in a Curious George episode. I have a Dr. Who rerun, but I don’t think she’ll go for that. I keep looking out the window, trying to catch a glimpse of the terrain below. Most of what I can see is flat farm country, but what I want to see is mountains.